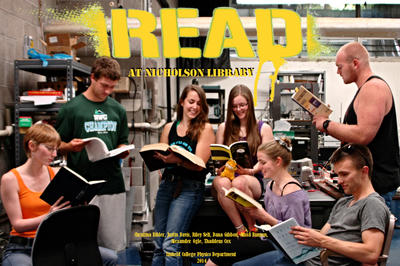 Linfield students Christina Bibler '15, Justin Davis '15, Riley Self '16, Dana Gibbon '15, Alissa Runyon '16, Alexander Ogle '16, and Thaddeus Cox '15 celebrate reading at Nicholson Library during the summer of 2014. Terry, Paula and Nicholson Library Staff, "Linfield College Physics Department READ Poster" (2014). READ Poster Gallery. Image. Submission 141.